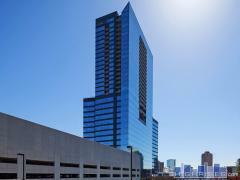 Live in the heart of Atlanta's historic downtown area. The Healey building is a stately high-rise with mesmerizing windows and a large dose of old-world character. In 2001 The Healey Building, Downtown's "Grand Old Lady," underwent one of the most significant conversions in Atlanta's history, opening her elegant, finely-crafted doors as urban condominiums. Homes in the Healey feature huge, original windows, views of the Fairlie-Poplar neighborhood's vibrant historic architecture, and all the amenities people have come to expect from luxury condominiums, including 24-hour security. Have any comments or questions about Healey Building? Ask your question and/or share your thoughts about this Building. Nice historic building and units have alot of character. Any suggestions on parking in the general area of the building for residents? what are the HOAs for unit 8A and is there an assigned parking space?